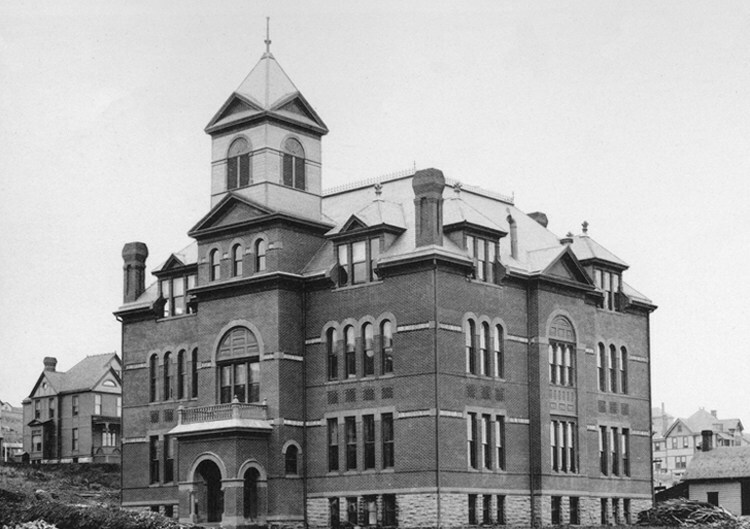 Although students graduated from high school in Duluth as early as 1879 (Duluth’s first two graduates were girls), the first building specifically constructed for use as a high school went up in 1886 and opened in January 1887 on the southeast corner of First Avenue East and Third Street. Prior to that, high school students were taught among elementary students in a wooden schoolhouse at the southeast corner of Lake Avenue and Third Street. The school board built a brick structure adjacent to the wooden school in 1881. Named Washington School, it served students from kindergarten through the eighth grade. While records remain unclear, apparently the wooden building was used for the high school from 1881 to 1886. The 1886 high school was three stories of red brick with a square tower which rose above the arched entrance on the front façade. Classrooms occupied the first and second floors while the third—with a high-domed ceiling—housed a combined gymnasium and auditorium. The building cost $33,000 in 1886, about $750,000 today. As Duluth boomed through the 1880s, the new high school soon became inadequate for the city’s growing population. The massive sandstone Central High School opened across the avenue from Duluth High School in 1892. Both older schools on that lot would have had to have been razed before that time to make room for it. At this time Duluth’s old high school became an elementary school and was renamed in honor of George Washington. When Washington Junior High opened in 1911 at 315 Lake Avenue North, Duluth had two Washington schools. In 1919 another building was constructed just behind Washington Elementary and named Liberty Elementary. In 1921 Washington Elementary closed and the building became home of the Duluth Board of Education and was renamed accordingly. Liberty closed in 1930, reopening briefly from 1944 to 1946 before becoming the Duluth Board of Education Annex. Both buildings served the school board until 1975 when the Board of Education offices moved into the vacated 1892 Central High School, whose students relocated to a brand new Central High School set atop the hillside. (In 2010 the 1975 Central High School was abandoned by the Duluth School District as part of its Long Range Facilities Plan.) 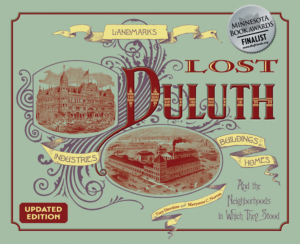 Duluth’s first high school was demolished in 1976. A parking lot now occupies the space.